What could happen in case of a gas attack in city? Emergency medical services and rescue teams have a nightmare: operate in "non-conventional" scenes. Like a terrorist attack. Gas masks, PPE protection and atropine. How can an emergency department be prepared to face a terrorist war scenario? 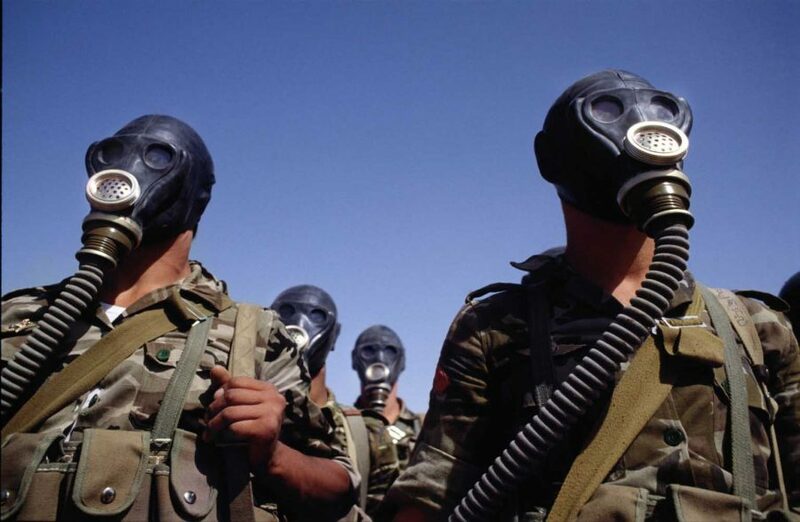 Nerve gas attack in Syria has been condemned by governments from all over the world, and there is a very strong reason: the nerve gases – including the Sarin one- are terrifying weapons which cause atrocious effects of pain on victims. Leave aside political evaluations, military assessments or judgments. There are some lessons to be learned and understood to know how to deal with an emergency situation in which a devastating chemical agent has been used. As always, it should be remembered that in case of a chemical attack, operators health must comply with the main rules of safe scene and must try in every way to stay safe themselves first. They must stay away from dangerous areas, if not equipped with the appropriate PPE. Often – as the operators who daily intervene on a scene know well – the first crews to reach the emergency scene are ambulances, not Fire Brigade (which have slower emergency vehicles and are located many times in far away places ). In case of chemical attack with nerve gas, what to do? The first warning is: do not enter the area hit without appropriate protection. Nerve gas toxins violently affect the nervous system, because they inhibit acetylcholinesterase (AChE) and affect or contaminate water or food by inhalation. Some types of nerve gas can also affect skin, and through the skin, cause the same effects but in a widespread manner on the human being. The most serious problem is that all the nerve agents have a considerable environmental persistence: they do not evaporate and do not rise in the air, but persist in the area where they were released (by means of bombs, mines, or even nebulizers). When it is clear that a gas has been spread in the area, and the first useful department of the Fire Brigade is around, the NBCR departments are called. These firefighting specialists are immediately distinguished by equipment and operational tools: antigas masks, electrochemical sensors, hazardous substances detectors are just some of the instruments of the NBCR operators have. These teams – 22 departments active throughout Italy – have available technical knowledge and experience to face the scenario without being contaminated. In cases of emergency, even the special departments of the Armed Forces could be called to intervene. At this time, however, there are official health units equipped with codified tools to intervene in the event of an NBCR incident. However, the health worker must wait until the area is codified by the Fire Brigade, before intervening. Because there are areas where access to health personnel could be inhibited. In the event of an NBCR event, in fact, the Fire Brigade, in coordination with the other intervention forces, divides the area into sectorized areas. In the operational areas, only persons strictly necessary for rescue operations can access, provided they are equipped with specific PPE. In the Red Zone it can also be defined as an area barred from anyone’s access. In the orange area – called decontamination – they only access suitable and adequately equipped crews. Finally, the yellow zone, which is the most external operating area, takes place during the dressing of operators who must enter the red zone, and a primary PMA is set up. Outside the yellow zone, another emergency space for logistics management can be set up. In Italy there is a nucleus of special health intervention, the NISS based in Vicenza: these are doctors, nurses and SUEM118 staff prepared to face a terrorist event and to treat victims of explosions or wounded by firearms. Doctors, nurses, drivers and specialists of the Suem Operations Center have been trained and prepared to manage a terrorist emergency that includes explosions and wounded by bullets. The project, which has no equal in Italy, was born from the will of the primary Suem, Dr. Federico Politi, who has followed emergency courses in Israel and the United States. And in fact, at the Suem of Vicenza, military design kits have arrived that allow interventions to block bleeding and to buffer wounds in a few seconds. Unfortunately there is no specific team like the one created by the English NHS, the HART team, where the paramedics have been equipped and trained as if they were firefighters, and therefore can access the warmer areas by bringing their scientific expertise. How to treat nerve gas intoxication? In addition to being fatal, the effects of nerve gas are particularly painful and conspicuous. To understand if a person has been exposed to nerve gas, you must note in the patient a tight miosis, strong disturbances in finding a stable position (accommodation), continued cough and bronchoconstriction, bradycardia, nausea, sialorrhea, involuntary urination and defecation, asthenia, fasciculations muscular and – when the effect is severe – paralysis. Subsequently convulsions, coma and death intervene. In these cases the rescuer must absolutely start the washing with a lot of water of the victim’s body, where possible by removing the clothes because the nerve gas, penetrated into the fibers, tends to remain there. The medical and nursing contribution is essential for the administration in two doses of atropine. The SIMG (Italian Society of General Medicine) notes that – from the treaties and experiences – the doses of atropine to be administered to patients who have been exposed to gas must be “heroic” or much higher than the traditional 2mg dose recommended in the common use clinical. It is therefore important that the pharmacies of the local hospitals are adequately equipped. There are some areas of the world (Israel and Iraq) where nerve gas has been used and inhibition of toxin has been treated with pridostgmine. The efficacy of prevention with this drug is known in animals but not in the human population. Doses can be injected repeatedly, after 5-10 minutes, until complete atropinization (appearance of mydriasis), up to a maximum dose of 100mg within 24 hours. Therefore, pharmacological prevention is not reliable because toxic reactions are at risk. The concepts in question come from the tests developed in Israel in the eighties and nineties. However, there would not be enough pyridostigmine stocks in Italy to treat the civilian population, since mass treatment is not advisable and since it is still a risky molecule. Therefore, emergency therapy with atropine is recommended, which blocks the peripheral and central actions of inhibition of AChE. Anti-gas KIT: how are the military organized? Since the nerve gas attack is statistically more likely in war zones, and is potentially used against military targets (using nerve gas is banned by global humanitarian conventions) in European armies there are specific kits with atropine 2mg and a reactivating drug of the AChE (like the pralidoxima). Fortunately, prevention with atropine revealed low toxicity in the population as a whole and also in children in Israel during the Gulf War. Are hospitals prepared for such an event? But if the military is potentially ready to face a similar threat, how are the hospitals organized? In all Italian hospitals, large stocks of atropine are present in normal solutions. The anti-poison centers scattered throughout the peninsula also have the appropriate skills and drugs to treat any kind of intoxication. It is known – to date – only in France an overall distribution of 40mg / 20ml injectable atropine sulphate solutions occurred after the terrible attacks of November 2015. In Italy, however, it is recommended, in case it is not possible to carry out slow initiations of atropine in adequate quantities, also the use of intra-osseous infusion of this drug.